and download entities in JSON format. The object browser runs directly on your device or on your development machine. 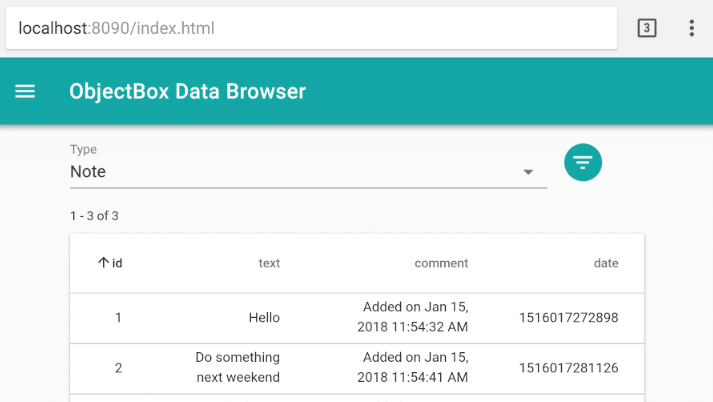 Behind the scenes this works by bundling a simple HTTP browser into ObjectBox when building your app. If triggered, it will then provide a basic web interface to the data and schema in your box store. We strongly recommend to use the object browser only for debug builds. Otherwise the build will fail with a duplicate files error (like Duplicate files copied in APK lib/armeabi-v7a/libobjectbox.so) because the ObjectBox plugin will add the objectbox-android library again. If you only use the browser library for debug builds as recommended above, they will not be added to your release build. When the app starts an object browser notification should appear. Tapping it will launch a service to keep the app alive and opens the data browser interface in the web browser on the device. To stop the service keeping your app alive, tap the ‘Stop’ button in the notification. Once the port is forwarded you can open a browser and go to http://localhost:8090/index.html. 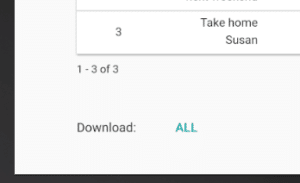 When viewing entities tap the download button at the very bottom. This will download entities formatted as JSON.